Joseph Baken, 22, from Billings, Montana, filed a false police report alleging injuries from a hate crime in Missoula on August 5 that he fabricated. Many on social media believed him, and are now retracting their stories. Missoula, Montana – The birthday gay bashing publicized across the web in Missoula turned out to be a false report. The web went viral with the story, which was also carried on Unfinished Lives, of “Joseph,” who claimed to have been beaten by three men outside a popular club in the wee hours of Saturday night/Sunday morning. 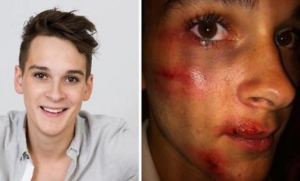 Joseph asserted that he was attacked by slur-shouting men because he asked where a gay club was in the area, so he could celebrate his 22nd birthday there. Now, thanks to the Missoula Independent story circulating yesterday, we know Joseph’s claims to be false. The facts of the case appear now to be that the alleged victim, Joseph Baken, 22, from Billings, actually sustained his bruises and other injuries doing a backflip on Higgins Avenue in downtown Missoula. The Independent has posted a video of the accident, which is also in the possession of the Missoula Police Department. Baken devised the story of the gay bashing to coverup his self-generated wounds. In the video of the backflip, Baken, who was apparently miming an Olympic athlete, stands backward on the curb, executes the flip, and lacerates his face upon landing. His audience, off-screen, tell him he “nailed it.” In fact, he chose to trivialize the violence done to thousands of gay and lesbian people by childishly seeking sympathy for an attack that did not occur. In breaking news, Joseph Baken pleaded guilty on August 7 to charges of filing a false police report. Missoula Municipal Court sentenced him to 180 days in jail and a $300 fine. The judge suspended the jail time. The Unfinished Lives Team apologizes to our readers for publishing its earlier story on this incident, and commends the Missoula Police Department for investigating and uncovering this fabricated story. Thanks to our reader, Steven Haines, for the link to the Missoula Independent. Here is a link to Andy Towle’s update on the story on Towleroad, as well. The fact that he would use gay bashing as an excuse also worries me. Its as bad as young people thinking it cool to contract HIV. Theae kids (straight & gay) seem so lost. How do we reach them?